Located in the Pacific Northwest region on the Pacific Coast of the United States, Oregon is the 9th largest state in terms of area and the 27th largest in terms of population. This makes Oregon one of the least densely populated states. Oregon covers an area of 98,381 square miles and has an estimated total population of 4.14 million people. Nicknamed the 'Beaver State', Oregon possesses some of the most varied landscapes in all of America including volcanoes, mountains, forests, high deserts, and large bodies of water. Such geographical diversity has allowed Oregon's economy to greatly diversify over the years, with major contributors to the state's economy including agriculture, hydroelectric energy, fishing, timber, and technology. The capital city of Oregon is Salem, but the largest city in the state is Portland. The Portland metropolitan area is the biggest metro zone in all of Oregon. Here are some additional details and statistics for the largest cities in Oregon. Located in Multnomah County, of which it is the county seat, Portland is by far the largest city in the state of Oregon. This major port city is situated in the northwestern part of the state and was named after a city of the same name in Maine. 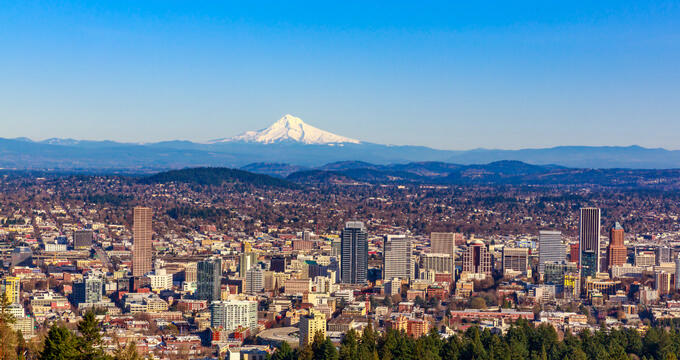 Portland covers an area 145 square miles and has an estimated population of 647,000, with over 2.3 million in the surrounding metropolitan area. Portland was founded in 1845 and quickly developed into a major economic and cultural center for the state of Oregon. It was once regarded as one of the most dangerous ports in America, but has since transformed into one of the most socially progressive and welcoming cities in the nation. Located at the confluence of two major rivers, the Columbia and the Willamette, Portland has always been a big trade and transport destination. Located in Marion County, of which it is the county seat, Salem is the second largest city in the state of Oregon. It is situated in the northwestern part of Oregon and is also the state capital. Salem covers an area of 48.45 square miles and has an estimated population of 167,000, with over 400,000 people living in the surrounding metropolitan area. Nicknamed 'The Cherry City', Salem was founded in 1842 and quickly became the capital of the Oregon Territory, remaining as the offical state capital when Oregon became a state. The city is a key educational center for Oregon, being home to Corban University, Chemeketa Community College, and Willamette University. Located in Lane County, Eugene is the third largest city in Oregon. It is situated in the western part of the state and covers an area of 43.74 square miles. The estimated population of Eugene is 166,000, making it one of just five Oregon cities to have a population in excess of 100,000. Eugene was founded in 1846 and incorporated in 1862. It was named after Eugene Franklin Skinner, an explorer who founded the town. Eugene is another big educational hub for Oregon, being home to the University of Oregon. It's also seen as a good place to visit for outdoor activities and recreation like hiking, cycling, and kayaking. Situated in Multnomah County, very close to Portland, Gresham is the fourth largest city in Oregon. This city is located in the northwestern part of the state and covers an area of 23.43 square miles. The estimated population of Gresham is 111,000, with over 2.3 million in the surrounding Seattle metropolitan area. Gresham was founded in the mid-19th century and incorporated in 1905. It was named after Walter Gresham, a Republican statesman and jurist. The city was originally a small agricultural settlement but has grown exponentially in recent decades due to its close ties with Seattle. Gresham is home to multiple historic places include the Jacob Zimmerman House and Louise Home Hospital and Residence Hall. Located in Washington County, of which it is the county seat, Hillsboro is the fifth biggest city in Oregon and the smallest city to have a population exceeding 100,000. Hillsboro is situated in the northwestern part of Oregon and covers an area of 24.25 square miles. The estimated population of Hillsboro is 102,000. The city, which was originally named Hillsborough, was founded in the mid-19th century and incorporated in 1876. It was named after David Hill, one of the pioneers who founded the city. Hillsboro is known for its many wineries and green spaces, being a popular city for outdoor and nature-based activities.